One thing we all have in common is that we face trials. A dictionary definition of a trial is “a situation that tests a person’s endurance or forbearance.” Those trying situations differ from one person to another. For example, a trial could be a medical diagnosis, a financial difficulty, or a family problem. Admittedly, in our humanness, it’s hard to welcome a trial. If there were a sign-up sheet for trials posted in our church each week, I don’t think there would be many names on the list! Our perspective in a trial can make a huge difference. Do we see our trial as a burden to bear or as an opportunity to grow in our faith? God allows trials in our lives to mature us and to draw us closer to Him. When we fight against those trials, we can’t learn the lessons God wants us to learn. In the midst of one particular trial we faced in our family, I ran to the book of Job. 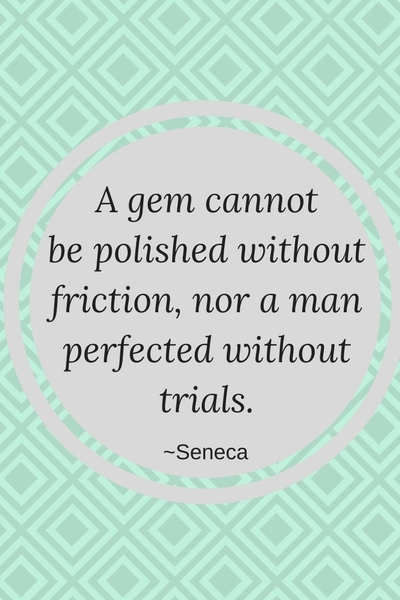 If ever anyone faced trials, he certainly did! Surely I can learn from his example. And I did. 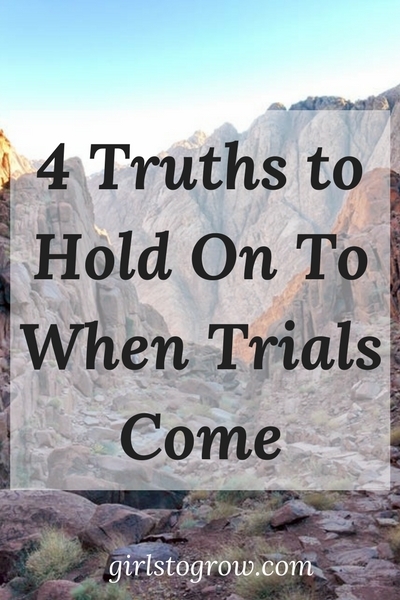 The following four truths helped me during that time, and continue to guide me when a trial comes into my life. 1. Trust. “Though He slay me, yet will I trust in Him…” ~Job 13:15 God is good, faithful, loving, and just. Whatever comes into my life is for His glory and my good. If my fears cause me to doubt, I should go to God’s Word and claim the promises I need for that moment. I can pray that promise to God, “reminding” Him of what He has said He will do. 2. Praise. “…the Lord gave, and the Lord hath taken away; blessed be the name of the Lord.” ~Job 1:21 Circumstances change, but God does not. He is always worthy of our praise. Focusing on God and His character will help me take my eyes off of my problems and turn my thoughts toward Him. Unbelievers won’t understand how we can praise God in the middle of hard times, and our lives can be a testimony to our faith as we allow the Holy Spirit to work through us. 3. Live Righteously. “In all this, Job sinned not, nor charged God foolishly.” ~Job 1:22 Going through a trial doesn’t give me an excuse to sin. In spite of all that Job lost, he continued to walk with God. That same God can give me strength to walk through my trials while remaining faithful to God’s Word. 4. Be grateful. “What? Shall we receive good at the hand of God and shall we not receive evil?” ~Job 2:10 How many of God’s blessings have I taken for granted? I am so very blessed, and no matter what trial I’m going through, I still have so many things for which to be thankful. When I don’t acknowledge God’s hand at work in my trials, I act foolishly. Notice the end of Job 1:22, which says that Job didn’t “charge God foolishly.” And in Job 2:10, addressing his wife who has told him to “curse God and die,” Job says, “Thou speakest as one of the foolish women speaketh.” My goal is to be a wise woman, not a foolish one! I hope I’m learning to honor God in my trials. During the trial that prompted this study of Job, my husband reminded me that this was all part of a bigger plan, to which I replied “I suppose.” He corrected me – and rightly so. Nothing takes God by surprise; He directs our every step. Job came through his trial with a renewed appreciation for the God He worshiped. He says in Job 42:1, “I know that Thou canst do every thing…” In the same way, we can get a whole new vision of our amazing God as we yield to Him in our trials and allow Him to do His perfect work in us. Oh, Tracey! These are such truths! But even knowing they are God’s truth for our situation, it is so hard to remember and even harder to do, especially for someone like me that runs to fear first! Thank you for this. I can totally identify!! I think worry is my default response to a trial, followed closely by “worst-case-scenario” thinking. I love that God is so patient with us, and will meet us where we are, then lead us on to where we need to be. We really can learn a lot from Job! Recently, I’ve started thinking that I wish I would hurry up and learn what God wants me to learn right now so that He would remove this trial from me. Have you ever thought that way? Um, yes, definitely! I guess that shows yet another thing God teaches us through our trials – patience 🙂 That’s rarely a fun lesson to learn, but I know how much I need it! Such important truths for those difficult trials that must come in our lives. I’m really working on trust. It should be so easy. When I look back on my life, He has always used trials for incredible lessons and pulled me through each one. Even knowing this, it’s quite hard when in the midst of one. Thanks for these reminders, Tracey! “When I don’t acknowledge God’s hand at work in my trials, I act foolishly.” YES!!! THIS!!! I can’t get these reminders enough.